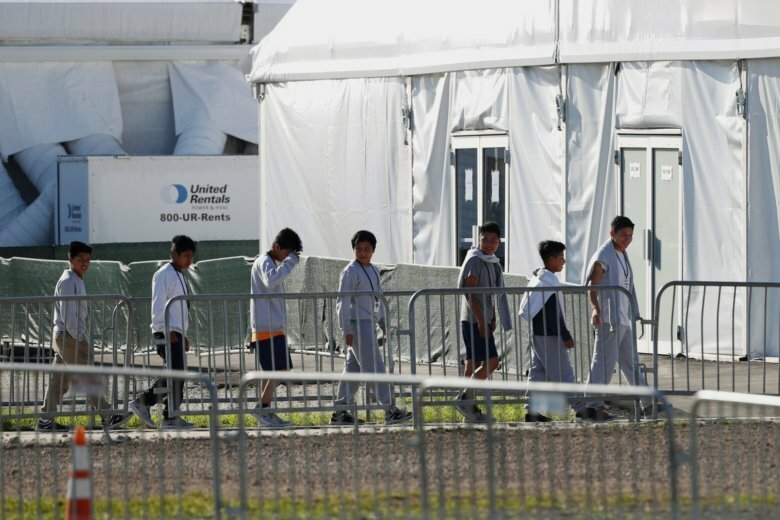 MIAMI (AP) — The corporation behind a Florida detention camp for migrant children abandoned its plans to go public Tuesday as controversy grows around policies that lock up children crossing the Mexico border. The chairman of Caliburn International Corp., Thomas J. Campbell, sent a letter to the Securities and Exchange Commission saying it no longer wishes to conduct a public offering. The Virginia-based company said in a press release the reason was “variability in the equity markets,” adding that business continues to grow. Previous filings cited risks of “negative publicity” as something that could affect share price. The U.S. Department of Health and Human Services, which takes custody of children who cross the U.S.-Mexico border, announced in December that the facility was expanding from 1,350 to 2,350 beds. Officials said the Homestead detention center in a Miami suburb is one of the largest and the only one run by a for-profit company. The agency offered a press tour last month of the growing facility showing a large room where 144 teenagers slept in bunks. Portable toilets were housed in adjacent tents. The children walked in groups of 10 to 15 in single file, led by a uniformed employee. Caliburn had also previously said it expected to increase its operations in housing children who are taken into custody at the U.S.-Mexico border. It attributed a growth in revenue to new contracts at Homestead and three smaller facilities in Texas. Comprehensive Health Services is the company that has been running the facility since then. But it was bought by a Washington private equity company called DC Capital Partners last March before the Trump administration announced a policy that led to more than 2,700 children being separated from their families and placed in shelters. John Kelly, who stepped down as President Donald Trump’s chief of staff in January, sat on the board of DC Capital Partners right before joining the White House, first as Homeland Security secretary. He also was a member of boards of other companies that are part of the private equity firm’s portfolio. In securities filings, Caliburn reported total revenue of $785 million in 2017. That does not include two large contracts totaling more than $250 million that the federal government has awarded Comprehensive Health Services since 2018. Darian Ibrahim, a professor of the law school of the College of William & Mary who has expertise in securities, said the company’s explanation Tuesday regarding equity markets “seems a bit strange” because a lot of other firms are looking to go public. Democratic lawmakers introduced legislation in December aimed at closing two unlicensed facilities in Homestead and Tornillo, Texas, which shut down in January after lawmakers and immigrant rights advocates pressed for the closure. Last month, Florida Democratic Rep. Debbie Mucarsel-Powell and other representatives toured the center and said they were concerned that a for-profit company was chosen to receive more children than any other facility and that some teenagers were being held there for months. The average length of stay at Homestead has gone up since last summer from 25 days last June to 67 days as of December. On Tuesday, activists who staged a demonstration outside the Homestead detention center condemned the government, saying it is helping a company grow a business out of detaining children. “As children await their freedom, the company is making a lot of money. It is supposed to be a temporary shelter, but this is being run as a business,” said Maria Bilbao, of the organization United We Dream. Associated Press writer Gisela Salomon contributed to this report from Homestead, Florida.